For other places with the same name, see Great Lakes (disambiguation). The Great Lakes are an important water system of North America for transportation, commerce, and recreation. Lying on the border between the United States of America and Canada, they are the largest bodies of fresh water in the world making them an invaluable natural resource. The size is difficult to appreciate until you see them: at 94,250 square miles (244,100 km2) combined, the lakes are nearly as large as the United Kingdom, and a plane flying over one will not see land. The channel light guides watercraft from Lake Michigan into the Sturgeon Bay Ship Canal, Door County, Wisconsin. Although lakes usually have names like "This Lake" and "That Lake", the Great Lakes are named the other way 'round as "Lake This" and "Lake That". In this area, if someone says something like "lets go to the Lake" without naming it, they're probably referring to the nearest Great one. Although much smaller than these five, Lake Saint Clair (between Southeast Michigan and Ontario, and between Lakes Huron and Erie) is part of the water system of the Great Lakes. The following regions lie around the Great Lakes. The following cities lie on or close to the shores of the Great Lakes. The Great Lakes cover a vast region, so there are naturally many points of entry, preeminent among which is Chicago's busy O'Hare International Airport. Other major airports, in order starting from the busiest: Detroit Metropolitan, Toronto Pearson International, Minneapolis-St. Paul International, Chicago Midway, and Cleveland-Hopkins International. The principal highways of the Great Lakes on the U.S. side of the border are I-90, which runs east-west along the south coasts, and I-94, which runs a more eccentric course from the west coast of Lake Michigan, through Chicago, central Michigan, and Detroit where it then passes across the river to Ontario. On the Canadian side, the King's Highway 401 runs west-east from Windsor-Detroit through Toronto and on to Kingston. The Trans-Canada Highway traces the northern shores of Lake Huron and Lake Superior. The Great Lakes boast some of the world's great urban skylines, and their crystal blue waters also provide anyone with a boat the means to take in a grand view of them. Chicago, the birthplace of the skyscraper, has a claim to be the greatest, but it's a hard claim to stake in a region with skylines such as those of Toronto and Detroit, and to a lesser extent Milwaukee, Cleveland, Hamilton, Buffalo, and Rochester. Natural destinations abound along the region's lakeshores. 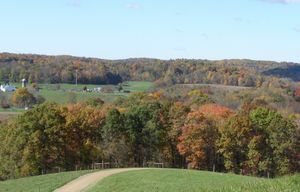 The Indiana Dunes, and Sleeping Bear Dunes, and Pictured Rocks National Lakeshore provide the most striking lakeside landscapes, while island destinations like the Thousand Islands, Isle Royale National Park, St. Joseph Island, the Lake Erie Islands, and Manitoulin Island make for natural vacation destinations. Major attractions right on the water are similarly in large supply. Chicago's Navy Pier on Lake Michigan is one of the most visited attractions in the American Midwest for its amusement park, live entertainment, shops, restaurants, and theater. Toronto's CN Tower on Lake Ontario is the tallest free-standing structure in the Western Hemisphere, providing tourists with great views, including one very steep one down from the glass floor. 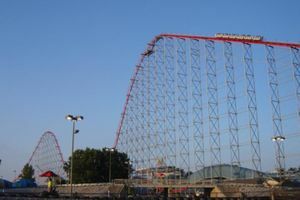 Cedar Point Amusement Park near Sandusky, Ohio, has been voted best amusement park in the world for at least a decade by Amusement Today. 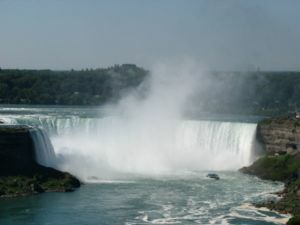 Perhaps the best known to the world, though, is massive Niagara Falls. Many boaters use the Great Lakes, St. Lawrence Seaway and their connection points as a travel route. There are many marinas and public boat ramps available for this purpose. Also, the Great Lakes Cruising Company  and the American Canadian Caribbean Line  provide cruises on the Great Lakes. Swimmers have the invasive species of zebra mussels from the Caspian Sea to thank for the clear waters—each one of the billions, the size of a fingernail, filters nearly a liter per day. They have been enormously disruptive to local ecosystems, and their sharp shells are a terrible hassle for anyone trying to clean the hull of their boat, but they have had a couple pleasant side effects. In addition to making the waters such a lovely clear crystal blue, their filtering efforts have increased population and size of smallmouth bass in Lake Erie and yellow perch in Lake St. Clair. Great Lakes Beaches are something most of the world has overlooked. While yes, for most of the year, it's too cold to swim, the southern coasts actually boast some fantastic beaches in the summer months. The lakes are big enough to make you feel like you are at the ocean, with waves to boot, but without the annoying salt and jellyfish. And throughout much of the water system, the water is actually clean enough to drink (not recommended) and certainly clear enough where you can freely open your eyes underwater. Some of the most famous beaches include the Great Lakes' longest at Wasaga Beach in Central Ontario, the beach volleyball hub of the Midwest at Lincoln Park Beach in Chicago, the beautiful beaches along the Indiana Dunes National Lakeshore, and the affluent beach communities along Chicago's version of the Hamptons in Harbor Country, Michigan. And even when it's too cold for swimming, several beaches throughout the region are actually known for surfing. There isn't any one sort of souvenir or good associated with the Great Lakes (aside, perhaps, from American automobiles), but there are plenty of great places to go shopping. Chicago's Magnificent Mile is renowned as one of the world's truly great retail strips. Yorkville serves much the same purpose in Toronto. A smaller retail location is in Detroit's Renaissance Center, which is probably worth a visit regardless of whether you want to shop at its many stores and souvenir shops. Tower City Center in Cleveland is another major shopping complex, with retail running the gamut from high end boutiques to low-end national franchises and back again. Rugged coast line at Cave Point County Park, Wisconsin. What could possibly unite the disparate culinary regions of the Great Lakes? Oh right, fish. Lake trout, wild salmon, chubs, smelt, perch, walleye, and whitefish are all very popular both among recreational and commercial fishers throughout the region. Smoked fish and shrimp is especially popular in small "shacks," particularly along the industrial shores of southwestern Lake Michigan, and you should jump at the chance to try some. Similarities end at fish, however. The Chicagoland area is a culinary delight, from high end contemporary American in Chicago, to low end regional fast food like Chicago-style pizza, hot dogs, etc., and cuisines brought their via the tides of immigration from the American South, Greece, Middle East, Mexico, Vietnam, etc. Toronto rivals Chicago for international cuisine, both high and low end, with enormous immigrant populations from all over Asia especially. There is one city in this region synonymous with drinking, and that is Milwaukee. Brew City was for a long time the world's leading beer producer, and remains firmly associated with the drink both in the popular culture ideal and the reality of the city's great nightlife. While none can rival that of Milwaukee, the cities and towns lining the Great Lakes largely share its affection for the drink, particularly in can form, accompanied with cheap shots of liquor. High end nightlife in the Great Lakes congregates in both Chicago and Toronto. Live music, however, is much more widespread, with vibrant independent music scenes throughout all the major cities, especially in Chicago and Detroit. Where next? Perhaps the obvious choice would be to head deeper into the American Midwest perhaps down the Mississippi River towards St. Louis, Memphis, and New Orleans or down through the cornfields to Indianapolis. Following the waterways east takes you along the St. Lawrence River towards Montreal, Quebec City, and on to Canada's Atlantic Provinces. Or you could turn south from the St. Lawrence towards Lake Champlain to get to Lake George and the Adirondacks. Keep following I-90 west to get deep into the American Interior. It will eventually take you into the Black Hills and Badlands region of South Dakota, home to Mount Rushmore (and a lot of bison), and on to Wyoming. Alternatively one might find great intrigue in the pristine Muskoka by driving roughly 2.5 hours North from Toronto, where a unique culture of multiple small-medium sized towns (Bracebridge, Gravenhurst) are situated amongst a landscape of many thousands of small lakes and interconnecting roads. It's a great place to see the stars and listen to wildlife without the constant roar of a highway in the distance and also while not forfeiting any convenience. This page was last edited on 25 February 2017, at 19:13.